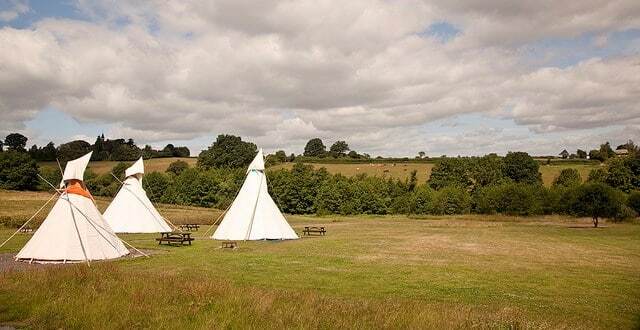 Four furnished Tipis at Family Campsite situated on outskirts of Historic Georgian town of Bewdley,nestled in heart of Severn Valley. Authentic Native American Tipis available for hire at family campsite on outskirts of Historic Gerorgian town of Bewdley within an array of cafes, bars, boutiques and gift shops. Nestled in the heart of Severn Valley with beautiful views across the surrounding countryside, we offer a friendly tranquil environment for all members of the family to relax, explore and unwind. 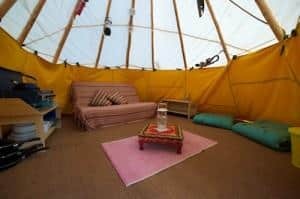 “An amazing camping experience”, each Tipi is furnished to provide comfort camping with an assortment of futons, camping beds, chairs, tables, rugs and throws. Also supplied are gas cooking store, pans, crockery, cutlery and cold box. Each Tipi has its own picnic table and external fire pit with cooking frame for that all important campfire. 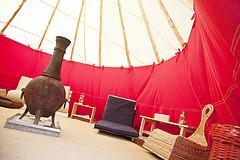 Amenities available on site include a Farm Shop, Cafe, Fishing Pool, Play Area and Picnic Area. A new toilet and showerblock was completed in April 2011 with hairdryers (in ladies) and a Laundry Room. There are various attractions nearby including Golf CLub, Wyre Forest with ‘Go Ape’ experience, River Severn, West Midlands Safari Park and Severn Valley Railway.